Description: NS Northbound Freight Train 340 rumbles through Grimes, Al. Description: Behind Lincoln-Lacy Motors I found UP Train MTTPB 18 stopped on the main with a Rare KCS Leader. 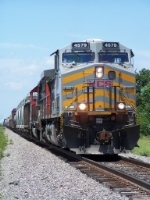 Description: A northbound empty grain train passes through Howe, OK. In what was apparently an unusual move (based on the dispatcher's instructions to the crew), this train would be interchanged with the UP at Sallisaw. 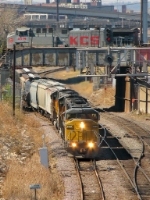 Description: KCS train H-KCSH rounds the curve at Howe, OK - MP 333.0. Description: KCS train H-KCSH passes through CP North Howe - MP 333.1. Description: Lead unit of train H-KCSH at the Heavener fuel rack. Description: Train H-KCHS at the heavener fuel rack. Description: KCS train H-KCSH getting all of its motors fueled. Description: KCS H-SHKC has dropped of it's three GPs, picked KCS SD70ACe 4052, and gets ready to head south at Heavener, OK. Description: Power for the CSX-Pasco moves light at 44th to pick up their cars. The only good thing about this lashup is the second unit. Description: In the middle of the consist on the H-CSXPAS. Description: Middle unit on todays CSX-Pasco at 44th Avenue Northeast. Description: CSXT Q106-20 (The Schneider Train) barrells track speed through MP 208 in Highland, Illinois on the Ex-Conrail Line headed for Marion Yard Ohio. Description: An eastbound KCS train runs across the Mississippi River bottomlands near Pleasant Hill IL behind five units.